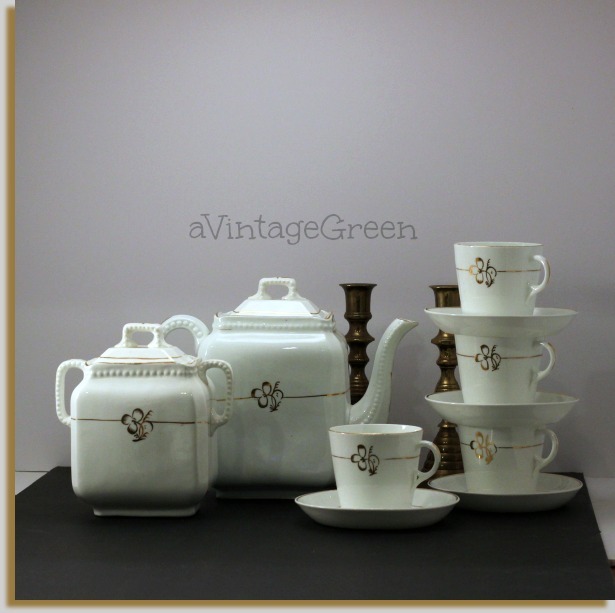 A quick visit to an out of town to a Thrift Store (yes that is the store name) yielded the white partial tea set with gold outlined clover leaf and line decoration - Golden Clover Leaf White Ironstone - no marks. The saucers are deeper than usual but there is a depression for the cup; 4 cups and saucers, a lidded sugar bowl and a teapot. Brass candle sticks in the background. Used my larger lightbox for this photo (more time working on lighting is in my future). Vintage Chippendale platter, Derek Brentleigh Ware England cream colour, painted with red roses and green leaves plant pot, Adams Titan Ware small creamer, white with red/yellow fruit and green leaves decoration. A set of Johnson Brothers (new, not vintage) pink Old English Castles Dishes. Friend provided the finds below, an ice server, and vintage glass. 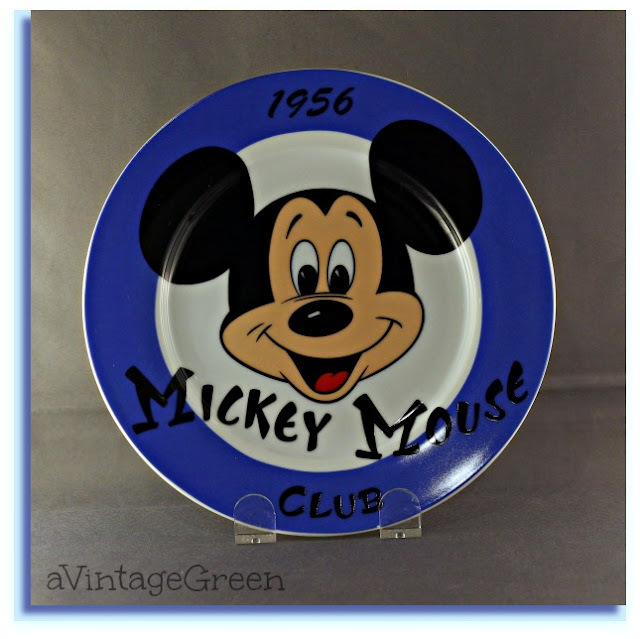 A blue Mickey Mouse plate, happily found to share with Sally on Blue Monday. 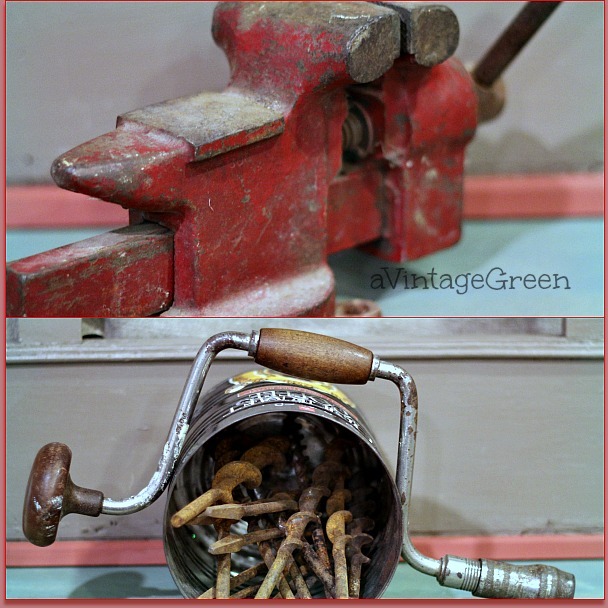 Another friend passed the vintage red shop vice and rusty bits as well as the drill to me. Vintage salt and pepper shakers. I was trying out my small portable lightbox and not having a lot of success in getting rid of shadows (I think I had the lightbox upside down - will be trying again another day). As many of my thrifting friends are mentioning in their posts, there are not many places for 'finding' great junk until the garage sale season opens again. Joy - Great finds! 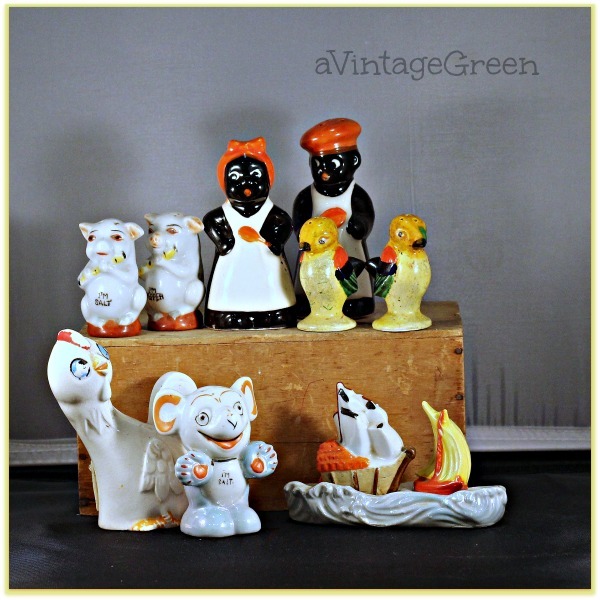 Love that set of Johnson - new or vintage. Gorgeous!! But, my favorite is all the flour sacks (at least that's what I think they are) in your header photo. 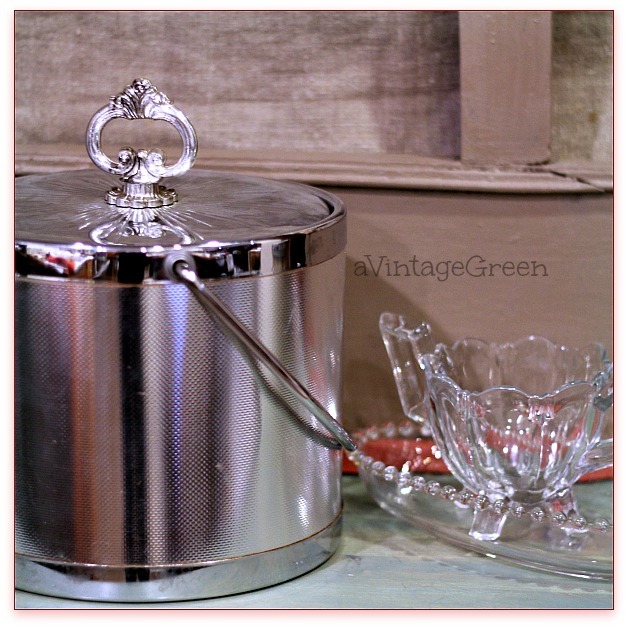 I love the3 shape of the lidded sugar bowl and teapot. Of course the tools will look great with a bit of polish. Great finds! I would think I had died and gone to heaven if I found a set of JB Old English Castles china! Have a great week, Joy. Love the tea set and the platter! Such pretty finds! The dishes are lovely - all of them, but my favorite is the white ironstone. I love the simplicity and it will be perfect for tea! 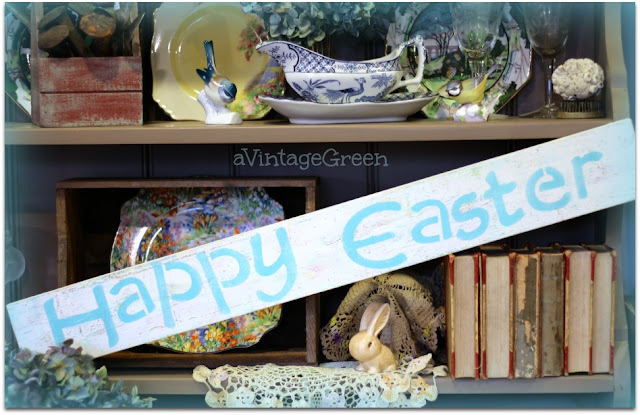 I hear you about the thrift stores going dry, but with spring will come more yard sales. Yea! You find so many treasures!! I enjoy seeing what you have discovered! I share your love of thrift stores as many do. Somehow it's more of a pleasure to share these treasures than any other find. Good for you! The tea set is very chic! Beautiful things you have. I especially like that MM plate. I know that they're probably still making them, but I'm impressed with its age. Isn’t it fun finding blues to share? Your Mickey Mouse caught my eye as I'm off to Disney World tomorrow for an overnight stay. Perfect for Blue Monday! I love your pink and white dishes too, I have some older patterns in a collection, but love this pattern! Good finds these weeks. I ha lve. Ot been in a thrift store since before Christmas. On purpose, I think. And does seem to be getting harder to find good stuff. Or perhaps I am over stuffed. Have a great week. Your scored some great finds....as always. Love the red dishes even though they aren't vintage...still beautiful! I am visiting from Stephanie/Enchanted Rose...what great finds, love them all. Thanks for sharing. Many Blessings to you. What some great finds! I love the tea set. I thought that was called Tea Leaves. You learn something new everyday. I really like the Mickey Mouse plate. That era was wonderful. The new show is okay, but I really miss the song MICKEY MOUSE-Spelled out in song. I started singing it one day and my kids were like, BonBon that's not how it goes. So, I'm learning all new things with my little munchkins. What a successful treasure hunt! 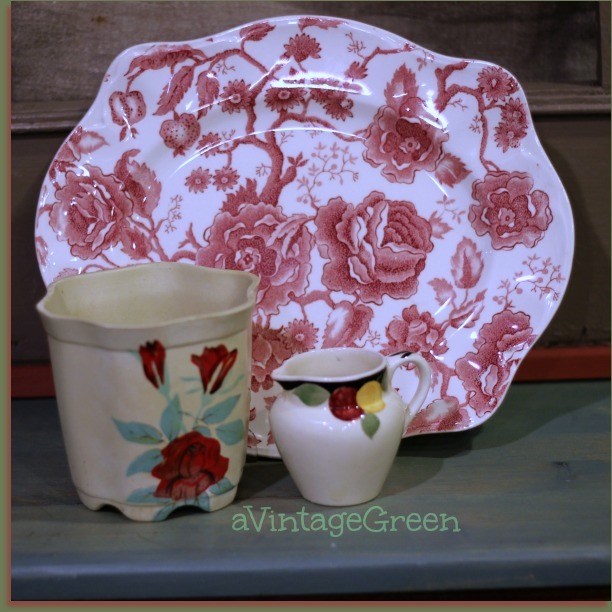 My favourite finds are the pink transferwares by Johnson. I have to agree with Margie....love the pink transferware!!!! I started collecting pink transferware a few years ago to use at this time of the year...fun to be on the hunt. What gorgeous finds Joy! I love that white & gold ironstone! You certainly have some wonderful treasures. 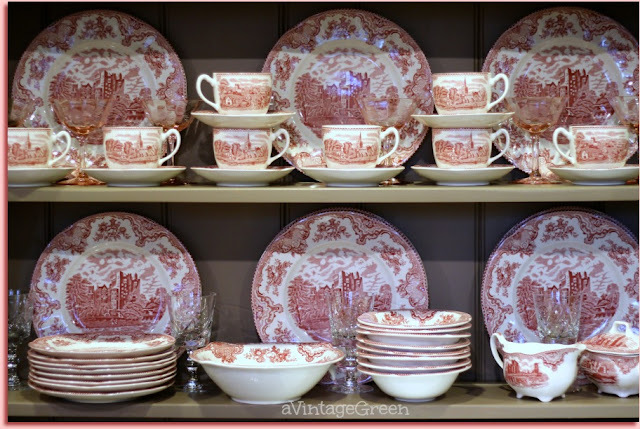 I love the JB pink Old Britain Castles china. I have some too. Hard to come by but thrilled to have them. The Mickey Mouse plate is cute too. Have a lovely rest of the week. I came over from Roses of Inspiration. 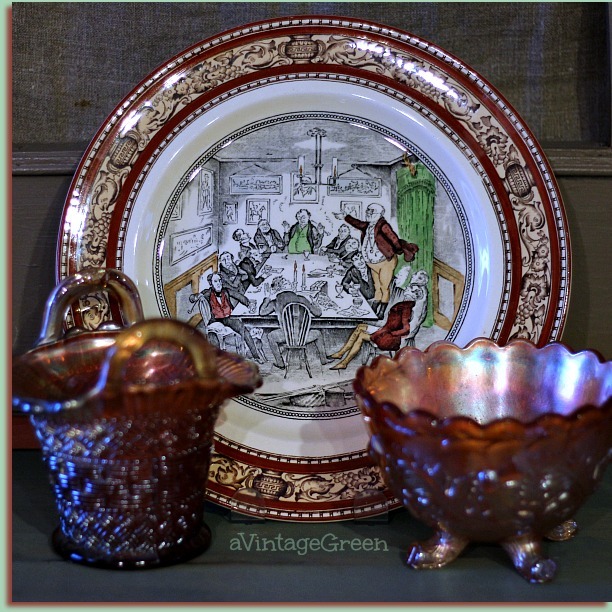 I love your Chippendale platter with the red roses and the lovely set of Old English Castles Dishes. Isn't if fun finding treasures at thrift stores and garage sales. Although, now days, since everyone wants them, they have gotten quite pricey. I remember the day when I could find these things for under $5. I enjoyed your vintage post. Ooooh, I am loving all of it, Joy :) I especially like those sweet salt and pepper shakers....too cute! It's always a pleasure to have you share your wonderful posts with Roses of Inspiration - thank you! Hugs and blessings!